201/301 Elementary Strength Training Circuit 3-in-1 This unit allows child to safely perform three major muscle group exercises. The first exercise is the is the Pectoral Press which is performed from a seated, upright position. The Pectoral Press works the triceps and the pectorals. The second exercise is the quadriceps deep knee bend which works the glutes and quads in one motion. The third exercise is the overhead press which works the deltoids. All exercises are performed while child is seated against a back pad with lumbar support for the entire sequence. . The quadriceps knee bend and overhead press may be done as one compound movement, if desired. Each exercise has its own adjustable resistance mechanism. Unit is fully self contained and has built in wheels for easy movement. Call 1-800-875-9145 to speak with one of our fitness advisors with any questions you may have. Go to FitnessZone.com today to order the Elementary 201 Strength Training Circuit 3-in-1. 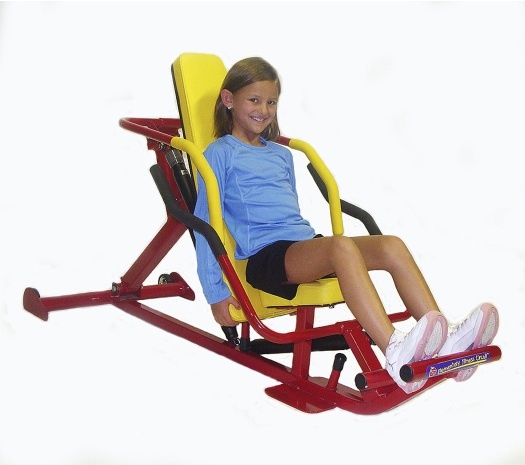 Order your Elementary 201 Strength Training Circuit 3-in-1 from FitnessZone.com today!